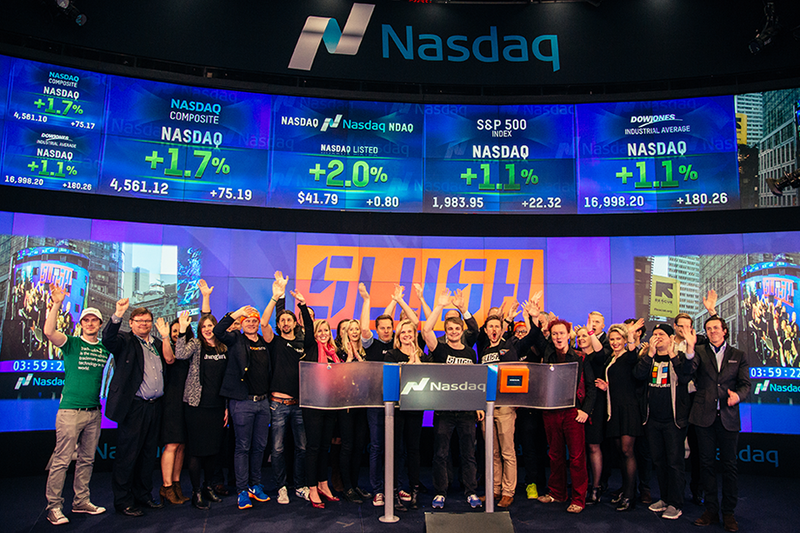 Two months and 43 countries later, Slush world tour came to an end in New York on Tuesday, where Slush’s team and ten startups from the Nordics had the honor of ringing the Nasdaq Closing Bell in Times Square. This was followed by an event at Spotify’s US office in Manhattan to give New York’s startup scene a taste of the North. Everyone is curious to know what has really happened in New York. So we sat down with our very own Jenny Gyllander, CMO at Slush, to hear the full story. She has just flown back from New York to Helsinki and in spite of the jet lag her excitement is palpable. “The day was full of so many incredible things, I don’t even know where to start”, says Gyllander who was part of the crew on the stage of Nasdaq and organized the 200-people event at Spotify’s NYC office. 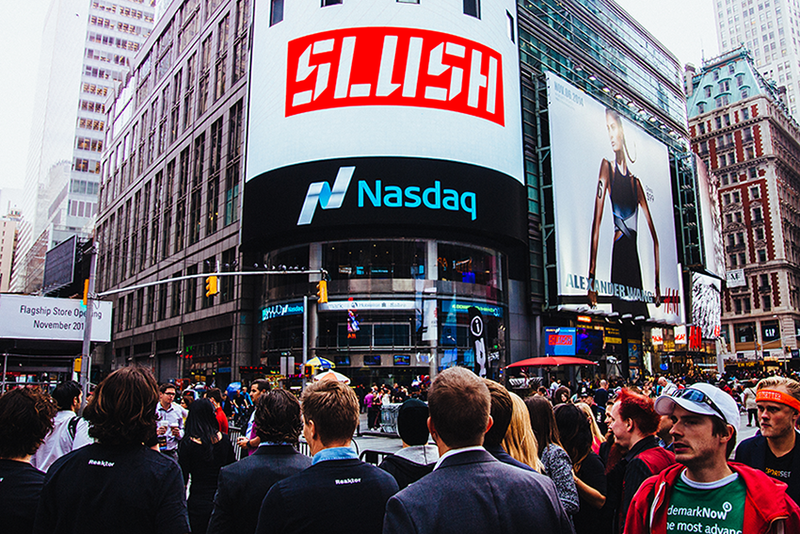 However, the most exciting moment for Gyllander was when she saw the Slush billboard ad on the Nasdaq tower on the world’s largest seven-story video display. More than one million people have seen the broadcast of the closing ceremony and the Slush billboard ad while passing by Times Square. This number makes up one fifth of Finland’s population. In total 10 companies were there ringing the bell – Slush, Transfluent, Erghis Technologies, ThingLink, Hem, Reaktor, Sportsetter, TrademarkNow, Tictail and Viima Games along with Amcham and the Consulate General of Finland in New York. 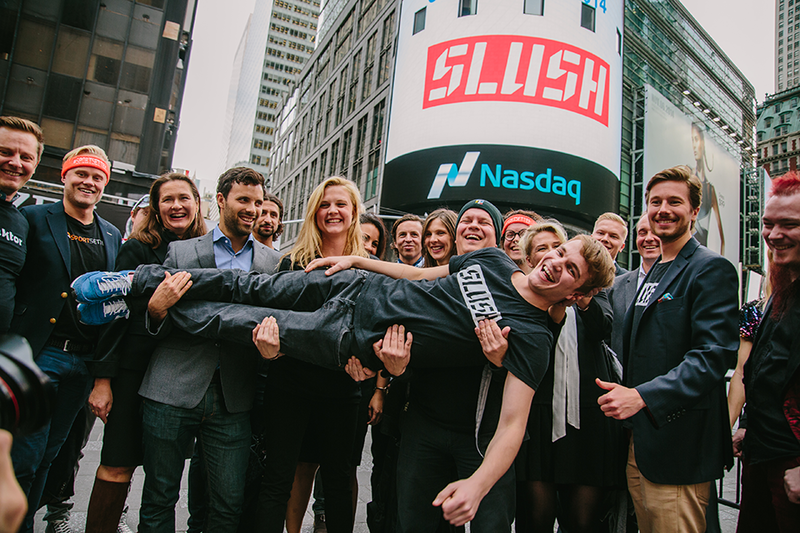 During the Closing Bell ceremony Miki Kuusi, the main organizer of Slush, said: “Standing together with these startups from the region on the Nasdaq stage, I hope that one day one of them will be ringing this bell on their own.” And this was exactly the purpose of the Slush NYC event – to encourage closer collaboration between the Nordic countries so that together we can put the region on the global technology map and produce more success stories. The sold-out event of 200 participants took place at Spotify’s US head office. The crowd included New York-based and Nordic startups, local investors and media representatives. Among investors were Rubicon Ventures and Union Square Ventures that has made many initial-stage investments into companies such as Foursquare and Twitter. The Nordic companies presented their products and shared the story of the Northern European ecosystem that has grown in an explosive manner in the recent years. The goal was to make the Nordic startup ecosystem known to the massive investor and technology community of New York as well as introduce Finnish companies to the local community. Ulla-Maaria Engeström of ThingLink shares her opinion on the event:“I was impressed to see such an interesting mix of entrepreneurs, high-profile investors, reporters and government officials at the event. Slush is doing a major favor to the Finnish and Nordic startup scene and to Finland in general by being proactive and hosting events where people can connect around interesting discussions and real life stories – not just self-promoting success stories.” The Finnish interactive image and video platform announced at the event that they reached a milestone of one million content creators. The event also featured a pitching competition with a jury that included Jesse Draper, the presenter of the popular The Valley Girl Show. The winner of the competition Surf Labs will come to Helsinki in November to show how their product is evolving the way professionals meet and network. “We had so much fun at the event and after-party – meeting and talking with so many entrepreneurs and investors. We were honored to be selected as a winner from such a talented group of startups”, comments Vince Koh, Co-founder of Surf Labs. The story doesn’t end here. We hope to see more Northern and international stars rise at Slush in just a couple of weeks.